Bordered by Ecuador and Colombia in the North, Brazil in the east, Bolivia and Chile in the south, and the Pacific Ocean in the west…Peru is one of the most culturally and geographically diverse nations in the world. Pair this with incredible history, culture, and affordability, and you’ll see why so many expats are choosing to live abroad in Peru. If you’re into history, Peru might be one of the most enticing countries in all of South America for you to live abroad in. The timeline of the land that modern Peru occupies dates as far back as 3200 BC, with the Norte Chico civilization in Caral, but perhaps Peru’s most famous era was that of the Inca Empire from the 13th-16th centuries. At its height, the empire occupied what is now Peru, Ecuador, Bolivia, Argentina, and Chile. In the 1500s, the Spanish conquistadors arrived to forcefully occupy the land of Peru. This led to a war with the Inca that lasted nearly a decade. While the Spanish had advanced military equipment and tactics, the Inca knew the land, had mountain fortresses, and were physically adapted to handling the high altitudes and strenuous conditions. In the end, however, the Spanish were able to outlast the Incas, largely due to foreign disease that they brought which the pure mountain immune systems of the Incas could not handle. The Spanish brought their language (both spoken and written), their culture, and modern technology…which combined with that of the Incas, created the distinct Peruvian culture of today. The unique mix of Andean and Spanish tradition in Peru has led to a beautifully rich and diverse culture. In the mountains there are still many Andean descendents, living in farming villages at high altitudes, sustaining themselves almost primarily on that which they can obtain themselves from the land. At the lower elevations and by the sea, there is a heavy Spanish influence, with more metropolitan cities, like Lima, resembling many of the major world capitals. Despite the modernity, however, those looking to live in Peru will find shimmers of tradition all around them. Through the artwork, craftsmanship (beautiful woven clothing and accessories made from the prized Alpaca fur), song and dance in the streets, and the food (guinea pig, chicken stews, choclo corn, and more than 4,000 types of potatoes native to the Andes), it is impossible to walk through any Peruvian city and not feel transported back to another age. 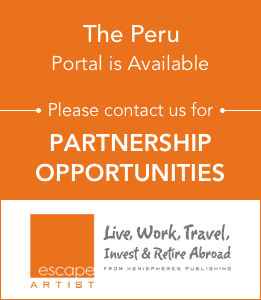 For expats looking to live abroad in Peru , there are many advantageous methods for legally living, working, or retiring abroad. Tourist Visa: Received upon arrival in the country, good for 183 days. Once expired, tourists will need to leave the country and return to renew it. Cannot work on this visa. Work Visa : Granted to any foreigner entering the country for the purposes, either independently or as an employee, of a lucrative endeavor that will benefit the national economy. Good for 183-365 days, depending on employment type, but can be renewed annually for the duration of employment. Investor Visa: A fast-tracked process for those capable of settling, developing, or managing single or multiple investments in Peru. The investment must be valued at a minimum of $154,000 USD. Retirement Visa: The Rentista Visa requires that applicants have a permanent $1000 monthly income while living in the country, plus $500 for each dependent applying. Holders do not have to pay annual resident taxes, and they are exempt from Peruvian Income Tax. Retirees living abroad in Peru can also import possessions from home, tax and duty-free. A three-bedroom apartment in Lima can cost under $900 a month. A week’s worth of groceries for a family of 2-3 can cost under $20. Central and South America are the best areas in the world for North American and European expats looking to live abroad, which is why they are so incredibly popular. While this popularity can cause more publicized countries like Costa Rica or Mexico to become increasingly expensive in the more tourist-driven areas, expats living in Peru are still benefiting from the country being under the radar. There are three main regions used to describe the landscape of Peru. The costa (coast), located in the west, is an arid plain with valleys created by seasonal rivers. The selva (jungle) comprises almost 60% of the country and is covered by the Amazon rainforest. The sierra (highlands) encompasses the Andes mountains and includes the highest point of the country, Huascarán Sur, at over 22,000 ft. 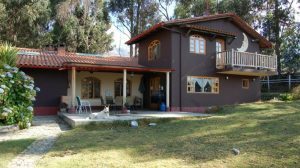 The mountain regions have frequent rain in the summers, with humidity and temperature decreasing as you ascend further up the Andes. Cusco, for example, at over 11,000 ft, has an average annual temperature of 52°F in the summer and 45°F in the winter. The jungle regions around the Amazon typically have heavy rainfall and high temperatures (annual average around 88°F). The coastal region, by comparison, has a more temperate, moderate climate with low rainfall but high humidity. This area averages 63-74°F annually. With an incredibly diverse array of natural beauty and wildlife, a low cost of living, and great residency options, Peru should definitely be considered by those seeking to live, work, travel, invest, or retire abroad. Tyler Sorce is an American writer and digital nomad, currently living in Lisbon, Portugal. In a past life he was a chef in Manhattan and Paris, follow his travels and favorite dishes on Instagram.